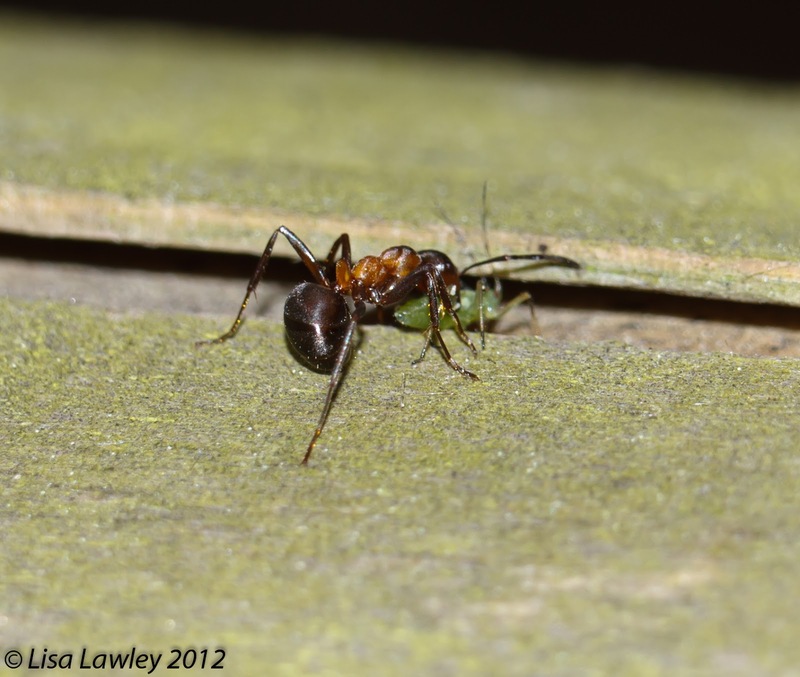 Wood ants were @SpeciesofUK from 21st to 27th April, 2013. 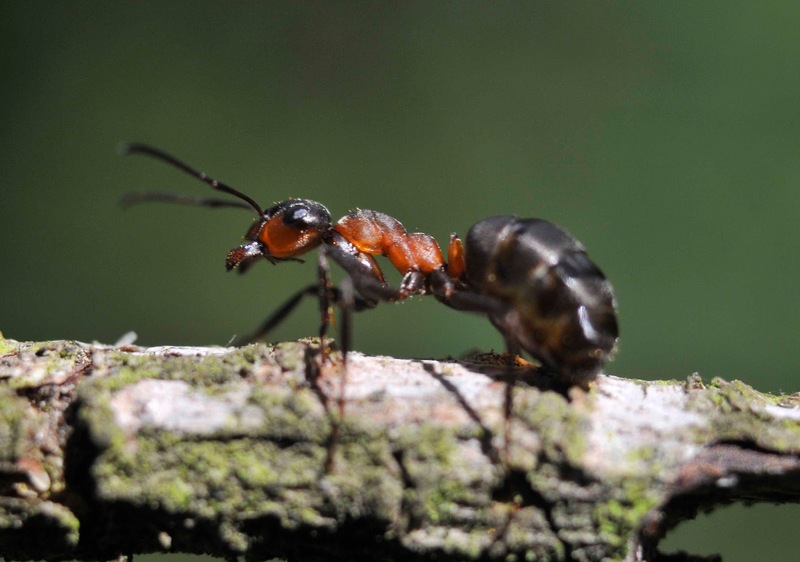 What is a wood ant? Well, first, what is an ant? 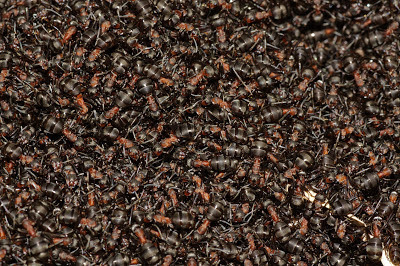 Ants (Formicidae) are social insects that form complex colonies. 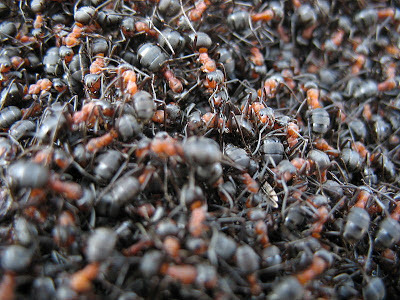 There are possibly more than 20,000 species of ants (they're still all being classified) in a multiplicity of subfamilies. It’s thought that ants make up at least 15% of terrestrial animal biomass. They're a rampantly successful group of animals! Wood ants are part of the Formica ant genus, a genus that is also made up of other mound ants, thatching ants and field ants. 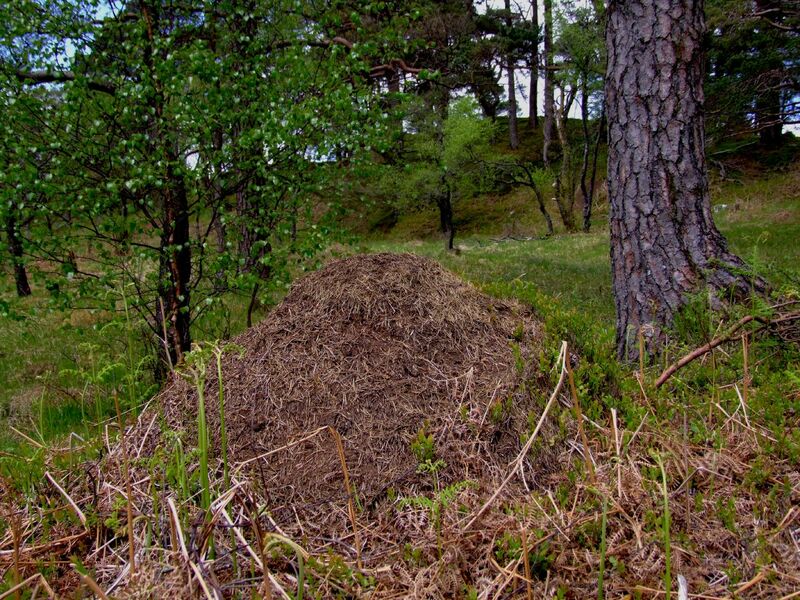 Wood ants as a general rule live in wooded areas and create impressive thatched mounds. How do you recognise a wood ant? Wood ants have a very distinctive appearance. The thorax is red, and the head and abdomen are dark. Wood ants are the largest of the UK's ants, with the queens measuring about 12 mm in length. They can occur in both deciduous and coniferous woodlands but they prefer coniferous. 1. The Southern Wood Ant, Formica rufa. This wood ant is concentrated in southeast England. It likes sunny glades rather than dense forest. It’s a large wood ant and is identifiable by the absence of hairs around the fringe of its head. 2. The Hairy Wood Ant, Formica lugubris. These ants have a fringe of hair from the rear of the head to the eyes. It is concentrated in Scottish Highlands. It generally favours young woodland. 3. 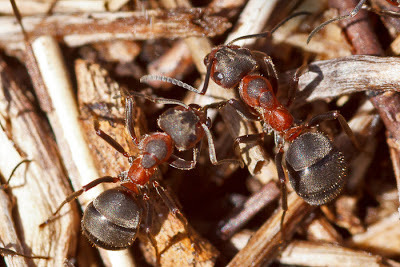 The Scottish Wood Ant, Formica aquilonia. They have a fringe of hair on their head but, unlike the Hairy Wood Ant, this doesn’t extend down to the eyes. It is happy in dense woodland and is concentrated in Scotland. 4. The European Wood Ant or Black Backed Meadow Ant, Formica pratensis. This ant is relatively dark. It makes small nests out in the open. Unfortunately, it’s been presumed extinct in Great Britain since 2005, but it is still present in Jersey and Guernsey. In reality, these four species all look pretty similar to the naked eye. Your best bet for identifying them in the field is by the location. In southern England, a wood ant is bound to be a Southern; in Scotland, it could be a Hairy or a Scottish! As with most ants, wood ants have a complex and fascinating system for division of labour. Wood ants have three castes in total: queens, workers and males (the workers are all female). Each of these have a very specific job. The queen's sole purpose is to breed and lay eggs. She lives for around 15 years, which is much longer than the males or workers. 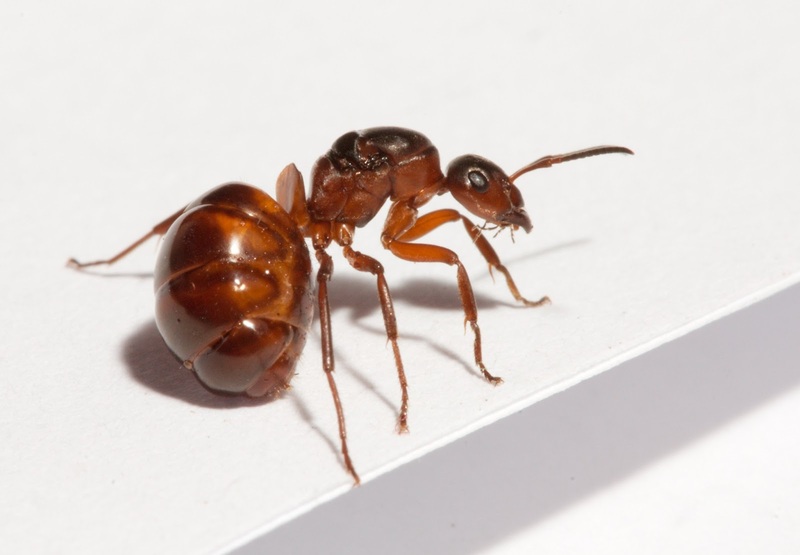 The majority of wood ants are workers, female ants that are not fully sexually developed. They do all the work, such as looking after the nest and the queen's brood. Worker ants live for about one year. They don't mate, but they do occasionally lay eggs which are then used as food. The males do not work. Their sole purpose is to mate with the queen. They don't live long, dying after their spring mating flight. In spring you will see winged ants appear. They swarm throughout May. 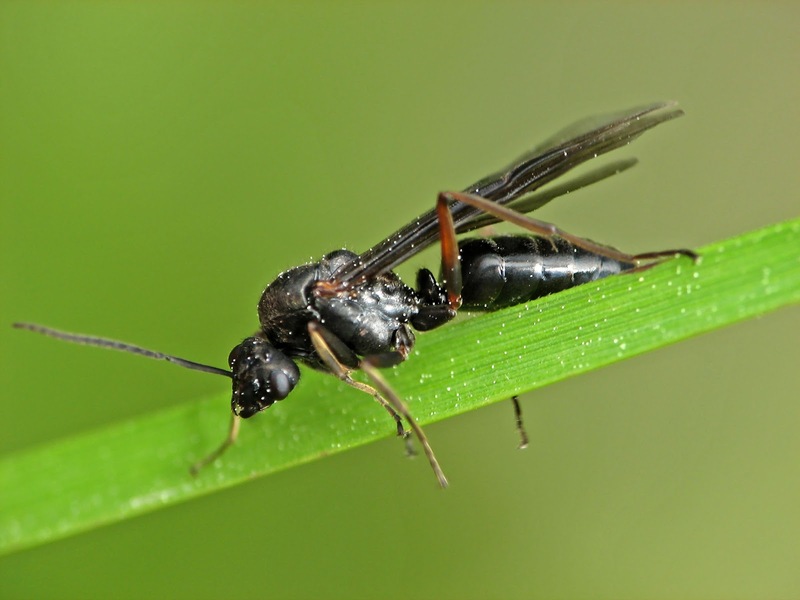 These winged ants are the sexually developed males and females. After mating, the female ants lose their wings and become queens. They will have collected enough sperm from this one mating season to last for the rest of their long lives. After mating, the males just die, I'm afraid. I can't find a mating image available to publish here under a creative commons license but you can click here to see one. 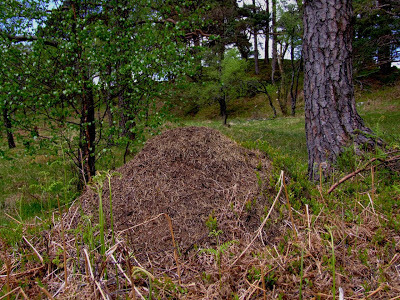 Wood ants are famous for their large, thatched mounds. The colonies number in the tens or hundreds of thousands, even up to half a million at most. If they can find them, most wood ants use pine needles as their building material of choice. They don’t place the needles randomly. They position them carefully to create a "thatched" roof that sheds water easily. The pine resin also has antibacterial properties. Worker ants sometimes sunbathe. It’s not for pleasure. It's so they can then go to the nest brood chambers to release the excess heat. They will also make the southern side of their nest flatter to present a greater surface area to the midday sun and so absorb more heat. A single wood ant nest can contain many queens. New queens sometimes leave the nest to create a nearby daughter colony. Wood ant eggs are tended to by the workers. The nests have many chambers of varying temperature and humidity. Worker ants constantly move eggs and larvae around to give them the best conditions to develop. The eggs hatch into helpless larvae whose sole purpose is to eat. Eventually they metamorphose in a cocoon into their adult form. 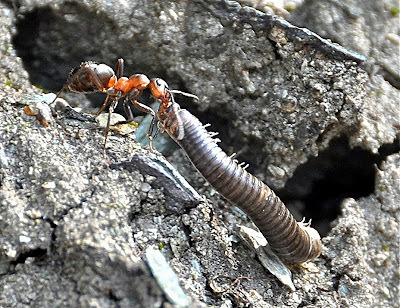 Wood ant workers are predators. They actively hunt other insects, stalking and then pouncing on them. 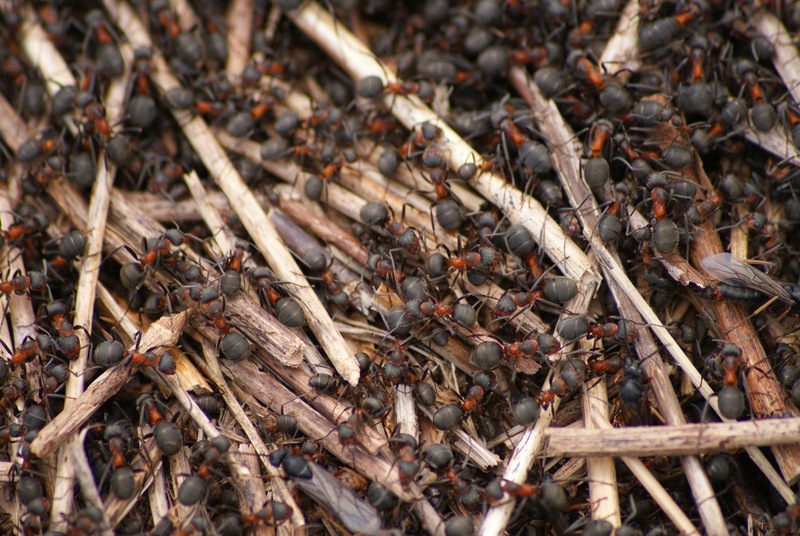 Wood ant hunting parties are fearsome and easily overwhelm larger insects. The Wood ants use pincer-like mandibles and formic acid sprayed 5cm from glands in their bodies to subdue their prey. They start hunting in the morning, when they can often be seen marching from the nest in columns along several trails, sometimes up trees. But wood ants aren't just hunters. They're farmers, too. They farm aphids which they 'milk,' stroking them to release honeydew. 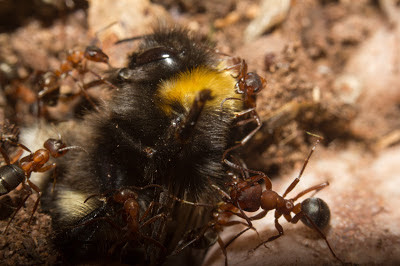 The Scottish wood ant also has a good relationship with the earthworm Dendrodrilus rubidus which it tolerates in the nest because it destroys mould and fungi. Wood ants, it’s thought, are right-handed. A nice informative account, SpeciesofUK. The second image, captioned "Formica lugubris", is not of a wood ant though, it is a Lasius sp, probably L. niger (common black ant) or related Lasius sp. The captioning in the Wikimedia Commons source is also in error. The image of "wood ant eggs" is also of Lasius sp (with pupae). The sadly-missed Formica pratensis is mostly known as the "Black Backed meadow ant" rather than European Wood Ant, due to its matt black thorax patches and preference for open sunny habitats. All our UK wood ants occur in Europe, together with several more spp which aren't found here. It would be very nice to have F. pratensis back again! Many thanks for your interest in the blog and for your comment. I have updated the post to correct the errors you picked up. Thanks again.